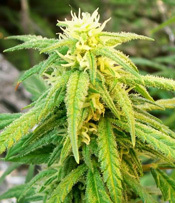 Growing: Â Easy to high This strain is a hybrid marijuana strain that is mostly sativa and can be grown in both an indoor and outdoor growing set-up. Â It belongs to the limited edition cannabis strains from Cannabiogen and one of the sativa dominated sativa plants that can be grown even by beginners who have basic understanding of marijuana cultivation. Â Though it can be grown both indoors and outdoors, it is best given space to grow to its full potential. Â Flowering time for this hybrid sativa is expected once it reaches 14 weeks from the time it enters vegetation. Â It will grow tall given space and will give high yield of potent sativa buds that are elongated and heavy it might bend the thin branches and therefore might need to be tied to prevent breakage. Â The effect when smoked is characteristic of fine Jamaican sativas which brings cerebral heady high with an uplifting effect. Iâ€™ve grown Jamaica Blue Mountain in the past and Iâ€™d say it is one hard to maintain weed plant in an indoor set-up.Â It just keeps on growing and I had to trim it regularly.Â Good yield and high tough.